This four-volume laboratory manual contains comprehensive state-of-the-art protocols essential for research in the life sciences. Techniques are presented in a friendly step-by-step fashion, providing useful tips and potential pitfalls. The important steps and results are beautifully illustrated for further ease of use. This collection enables researchers at all stages of their careers to embark on basic biological problems using a variety of technologies and model systems. This thoroughly updated third edition contains 165 new articles in classical as well as rapidly emerging technologies. Part A. 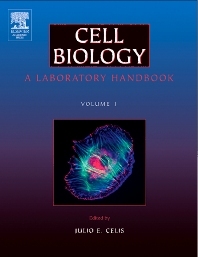 Cell and Tissue Culture: Associated Techniques. Section 2. Culture of Specific Cell Types: Stem Cells. Section 3. Culture of Specific Cell Types: Haemopoietic, Mesenchymal, and Epithelial. Section 4. Differentiation and Reprogramming of Somatic Cells. Section 6. Somatic Cell Hybrids. Section 7. Cell Separation Techniques. Section 8. Cell Cycle Analysis. Section 9. Cytotoxic and Cell Growth Assays. Section 11. Assays of Cell Transformation, Tumorigenesis, Invasion and Wound Healing. Section 14. Growth and Purification of Viruses. Section 15. Production and Purification of Antibodies. Part A. Organelles and Cellular Structures. Section 1. Isolation: Plasma Membrane, Organelles, and Cellular Structures. Section 2. Vital Staining of Cells/Organelles. Section 4. Endocytic and Exocytic Pathways. Section 9. Signal Transduction Assays. Section 10. Assays and Models of in Vitro and in Vitro Motility. Section 11. Mechanical Stress in Single Cells. Section 2. Digital Video Microscopy. Section 3. Confocal Microscopy of Living Cells and Fixed Cells. Section 4. Fluorescent Microscopy of Living Cells. Section 5. Use of Fluorescent Dyes for Studies of Intracellular Physiological Parameters. Section 6. Digital Image Processing, Analysis, Storage, and Display. Section 7. Specimen Preparation Techniques. Section 9. Electron Microscopy Studies of the Cytoskeleton. Part C. Scanning Probe and Scanning Electron Microscopy. Section 11. Scanning Probe and Scanning Electron Microscopy. Section 12. Tissue and Chromosome Microdissection. Section 15. In Situ Hybridisation. Part H. Transgenic, Knockouts, and Knockdown Methods. Section 17. Transgenic, Knockouts and knock-down methods. Part A. Transfer of Macromolecules. Section 3. Somatic Cell Nuclear Transfer. Part C. Gene Expression Profiling. Section 5. Differential Gene Expression. Section 6. Protein Determination and Analysis. Section 7. Sample Fractionation for Proteomics. Section 9. Detection of Proteins in Gels. Section 10. Gel Profiling of Posttranslationally Modified Proteins. Section 11. Protein/Protein and Protein/Small Molecule Interactions. Section 15. Mass Spectrometry: Protein Identification and Interactions. Nigel Carter is the Head of Molecular Cytogenetics at the Sanger Centre, Cambridge UK and is currently the Secretary of the International Society for Analytical Cytology. Receiving his BA and D.Phil degrees from the University of York where he specialised in parasitology, Nigel became interested in flow cytometry when he was appointed to the Nuffield Department of Surgery at the University of Oxford in 1981. In 1989, Nigel took up a post in the Department of Pathology, University of Cambridge to use molecular cytogenetic technologies to study human karyotype abnormalities. Nigel's work in this field has involved the application of digital microscopy to fluorescence in situ hybridisation and the development of flow cytometry for chromosome sorting for the generation of chromosome-specific DNA libraries and paints. J. Victor Small received a Ph.D. in 1969 at Kings College, London from where he moved to Denmark to take up a lectureship at Aarhus University, which he held until 1977. Thereafter, he became department head in a new institute, the Institute of Molecular Biology, established by the Austrian Academy of Sciences in Salzburg, of which he is the current director. His work has centered on smooth muscle biochemistry and structure and on the mechanism of cell motility. David Shotton, since 1981 a University Lecturer in Cell Biology at the University of Oxford, graduated in biochemistry from Cambridge University in 1965. During his doctoral research at the MRC Laboratory of Molecular Biology, Cambridge (1965-1969), he completed the sequence and crystallographic structure determination of the enzyme elastase. Following postdoctoral studies at the University of Bristol, Berkeley, and Harvard, during which he changed fields to cell biology, studying membrane structure, he took a lectureship at Imperial College in 1976. His current interests include cellular immunology, advanced light and electron microscopy techniques, digital image processing, and hypermedia.